Oh, to be in McMinnville, now that IPNC’s there’ somehow falls shy somehow of poesy immortal, but if the words themselves could give Browning [and even you, Thirsty Reader] the dry fantods, the sentiment is worthy. 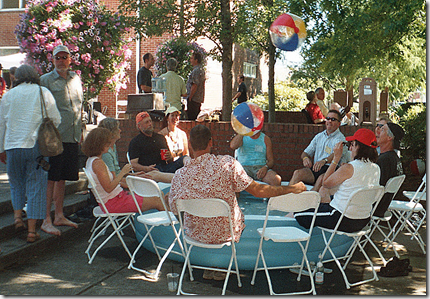 For the IPNC is celebrating its 25th anniversary July 29-31. Some may gallivant at the other IPNC [a.k.a. the International Pathogenic Neisseria Conference in Würzburg. Yes, it is nicely surrounded by the umlauted likes of Veitshöchheim, Waldbüttelbrunn, Wöllriederhof and the -dürrbachs Unter and Ober], but the real thing and right stuff, found only in McMinnville, Ore., is the Internation-al Pinot Noir Celebration. 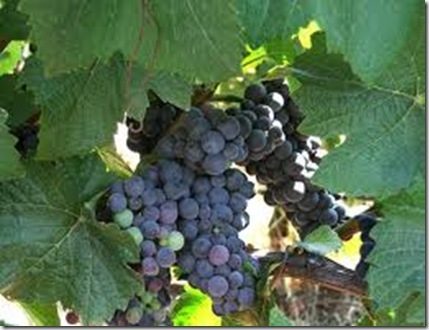 What the fuss is all about: Pinot Noir grapes. Photo courtesy of Laurel Ridge Winery. You could run across some taka mavens, such as Jancis Robinson, say, or Ray Isle of Food & Wine, or famous winemakers like Pete Rosé, the switch-hitting infielder and saignée specialist. You could visit some vineyards and dine very well and drink a goodly quantity of excellent Pinot Noir, the local likes of Eyrie and Erath,Chehalem, Sokol Blosser, Ponzi, the 5 A’s [Adelsheim, Argyle, Amity, Archery Summit and Anne Amie], Domaine Drouhin, Bethel Heights and Brick House, Cristom, Rex Hill and WillaKenzie. And other Willamette Wonders, plus more from hither and yon: California and New Zealand, and French Burgundies. Winery visits? But of course. Most important, the famous Salmon Bake. Of which more anon. 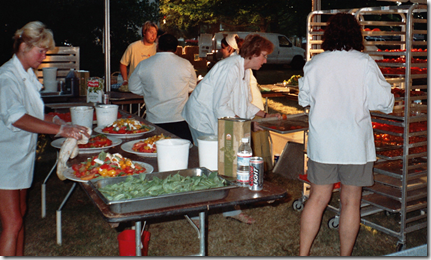 I attended the IPNC [pronounced ipnick] a few years ago owing to the event’s Amy Wesselman, who gently but persistently nagged over several months. I resisted; having been to such fests before I viewed them with a warm rush of loathing. They seemed always to be either ‘laid back’ to the point of chaos or rigid with Teutonic regimentation—and to boot were always grossly overcrowded. In the end, Amy won and I’m glad she did. Not to say there weren’t some shocks. First, the temperature. Had the previous summer had been a hot one? If so, Oregon was taking no chances. The airport was so cold you could hang meat in it, and while folks elsewhere craved tans, the locals favored a palette of ACB [air-conditioning blue]. Then there was the air itself—almost unbreathably clean stuff, devoid of any taste or texture. Here in Manhattan, which bards in fealty to Apollo hold, we are used to air that’s full-bodied, with a long, diesel-nuanced finish and an abrasive texture. Terroir air, in short, to which Oregon’s was but kids’ stuff. 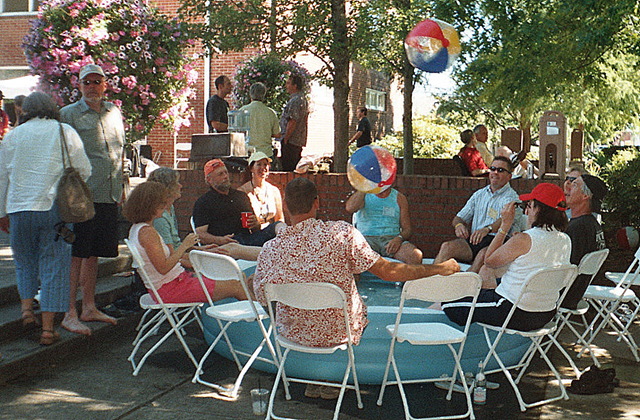 Still, there was compensation in IPNC’s calm and serene organization. La Wesselman had been in command back in the day when Gen. William Booth entered Heaven, apparently, and that event went off with celestial perfection. So here she was equally skilled. No long lines of guests grown mutinous because of missing guides and transport, just seats aplenty and no one clinging to the roof racks. The tasting tables were swaybacked with Pinot and eagerly attended but without attracting that taster’s curse, the pesky little knots of two or three oblivious dolts who insistently park or plant themselves and refuse to move. 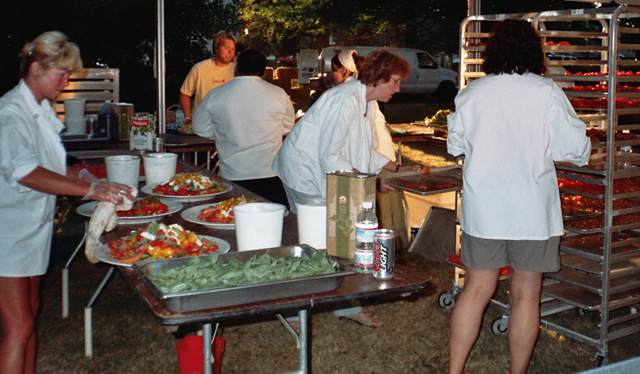 Dinners on the campus meant fine food and wine to match, both in abundance. There were lines, but they didn’t stand still. The carvers hewed with an alacrity worthy of their kin at Katz’s; the commissary staff was likewise up to the mark. Guests were no sooner seated than Pinot was poured restoratively. IPNC commissary staff: ain’t no flies on them. The evening’s centerpiece, long and fiery Salmon Bake, deserved a four-color full-bleed magazine spread, assuming that anyone still remembers what magazines are. Or were. 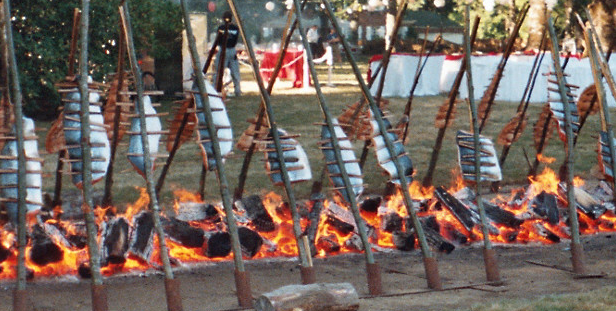 The event is no mere cookout, and its importance lies in being not just a ‘traditional’ Native American affair but a genuine one, devoid of Disney-hokery. 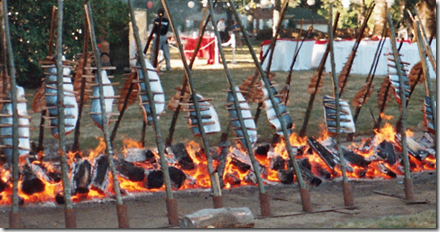 It is not what was done once but that still is today: this is the way wild salmon is cooked by the Indian tribes of the Pacific Northwest. 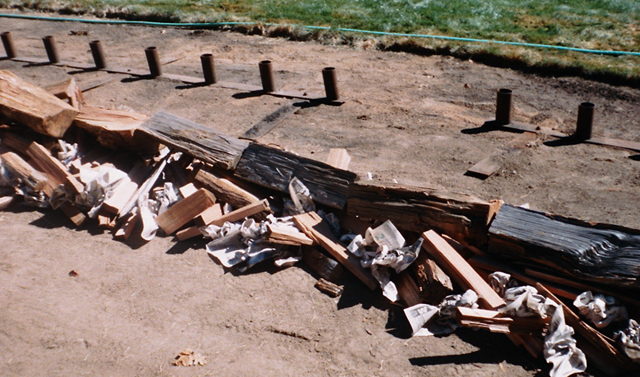 For the first couple of hours, preparations for the Salmon Bake resemble lawn vandalism. 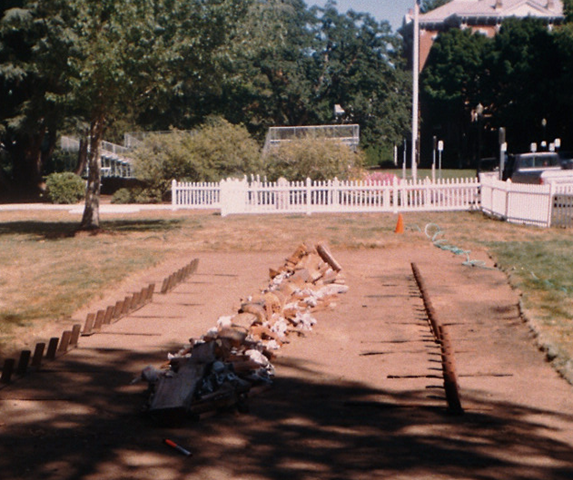 A rectangle of Linfield’s lawn is marked off and denuded of sod by Smith’s team of 12; then down the center of it they neatly cut a long narrow trench. This they fill with a little newspaper kindling and a deal of hardwood, whole logs and splits. 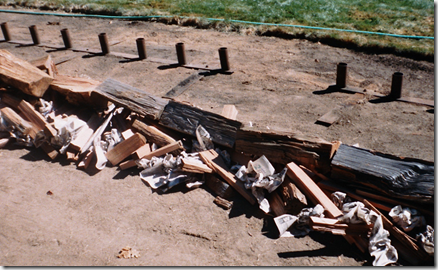 The ground is clear and the fire is laid. 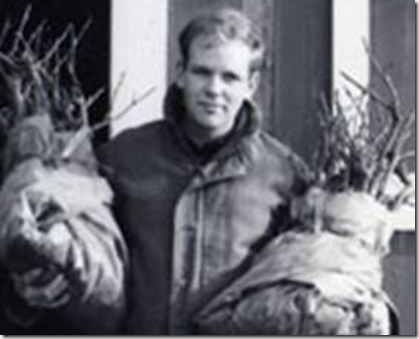 Short lengths of pipe [background] serve as sockets for the salmon-bearing alder saplings. 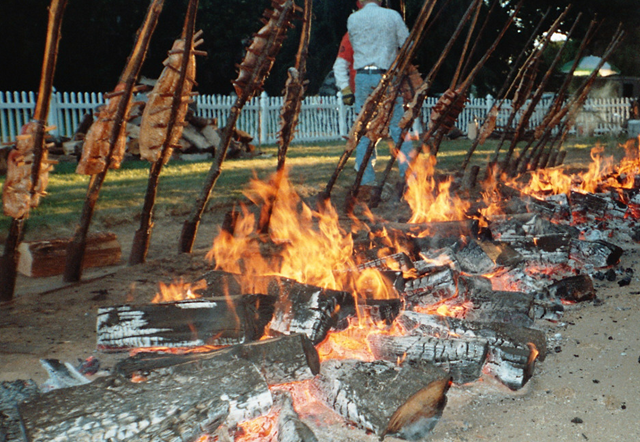 The whole is set alight in the afternoon, and while waiting for the flames to subside, the team lashes split salmon to the green alder saplings that will suspend them above the pulsing heat of the embers. Mid-afternoon: the flames are banking down and several dozen salmon go to glory. It is, Thirsty Reader, not the sort of thing you see every day, which is why the photos here give pride of place to the Salmon Bake. Pictures of wine bottles surrounded by schmoozers and schnorrers are two-a- penny on a good day. A last look before these salmon are served. I must say a word too about the breakfasts—what I think of as the Semi-Sportive Breakfasts because of their non-competitive athleticism. As for the food, remember that 1950s anecdote about Mr. and Mrs. DiMaggio entertaning our troops in Korea, with Marilyn returning to their hotel after one of her deafeningly successful appearances and naively saying ‘Joe, you never heard such cheering!’ And he evenly replies ’Yes I have’? Well do but substitute seen/bacon for heard/cheering and you’ll get the picture. Then repeat, with waffles. Starting the day with a volleyball breakfast. The athleticism centered on wading pools ringed by blissed-out munchers dunking their dogs and kicking, heading or batting beach balls about with no particular end in view. No scores were kept, so it was no-net-tennis, so to speak, and Robert Frost wouldn’t’ve approved. What mattered was nothing less than players’ proper etiquette, which held that anyone could return any ball that came his way to any other pool in any way but without leaving his seat or significantly interrupting his meal. David Lett in the 1960s with a double armload of Pinot Noir. Photo courtesy of Diana Lett. Next year’s IPNC will be held July 27-29, and it will be the part of wisdom to request event and ticket information pronto from [email protected]. Post-IPNC I discovered the town’s Historic District [both blocks!] as well as its farmers’ market, which compensate for the poison of Rt. 99W. McMinnville’s share of 99W is its main drag [in both senses]: a fluorescent glare of strip-mall marts, car dealerships and gimcrack road-front businesses decorated with parking lots, hideous and apparently endless. Did I really see a sign reading ‘Last Strip Mall for 50 Yards’ or was I [please!] hallucinating? The Historic District may be small but it convinced me that just about nothing built in the last half century is worth a second glance. The surprise or even shock of McMinnville was the Evergreen Aviation and Space Museum. Airplanes galore: The EASM is large and well-organized, with superb restorations. 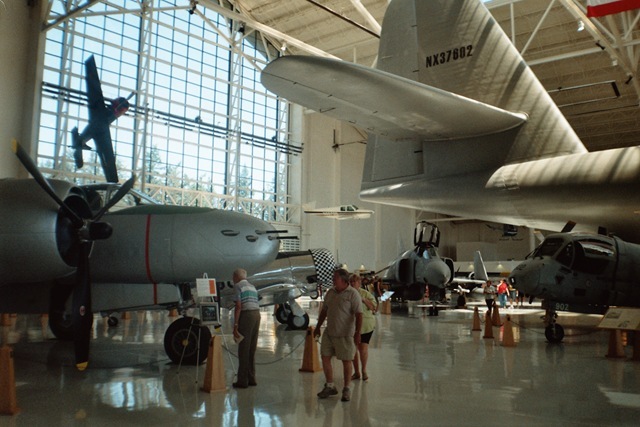 With its IMAX theater and dozens of professionally restored airplanes, among them Howard Hughes’ infamous Spruce Goose, combat airplanes from WWI to the present, and many more, this museum is a must. Its wide array of well-documented, well-organized exhibits would do the Smithsonian proud, let alone a town with a population of 32,000. 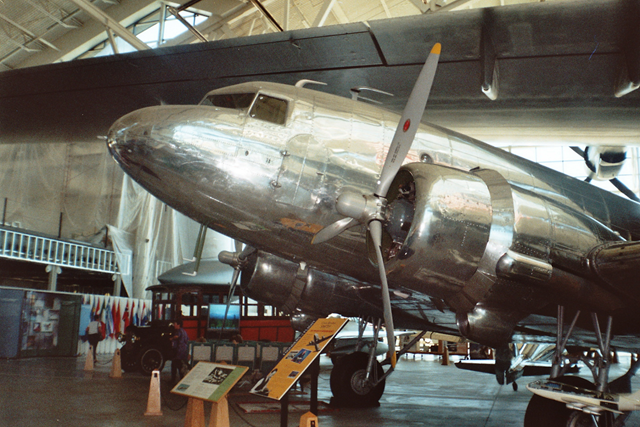 This ex-United Airlines DC-3 is one of several airplanes that crouch comfortably beneath the wings of the enormous Spruce Goose. Then it was back to the airport for me. There I realized I’d got used to the air-conditioning as well as the air and was told that I look good in blue.